Kyle has been working at an extra position around 10 hours per month for a few months now, so we have had some time to adjust to having this additional income stream. He wasn’t looking for more income, but rather volunteered for a position (that we later found out was paid) so that he could learn a new skill. While I still stand by the method of handling irregular income I outlined earlier, that strategy is for people who depend on their irregular income for their normal living expenses (for instance if that is their primary income). We have chosen not to count on Kyle’s side income as 1) we don’t want to inflate our lifestyle and 2) Kyle should feel free to stop working extra if he gets overwhelmed with school/job searching. Since our budget is completely based on our income from our full-time jobs, this other income is all gravy. But we don’t want to just blow the extra income on eating out or entertainment on a month-to-month basis as we recognize that at the end of the year it will add up to something substantial. Since several components of our budget operate off percentages of our total income (taxes, retirement savings, giving), we decided to take into account those priorities with each extra check we get. But after those obligations are taken care of, we have approximately half the income to do whatever we want with – that’s the true gravy part of the gravy. If we had debt, we would probably throw all of it toward debt repayment – if we had a mid-term savings goal, we would use it there – but we don’t. Since Kyle is the one earning the extra paychecks, we agreed he should be the one to decide how to use this portion of the income (of course toward shared spending). He chose for the gravy gravy to go into our Travel account at the present. I think this is a great solution because we don’t miss the money in our regular budget and it is guaranteed to go toward an awesome purpose. Do you have irregular income? If so, is it something you budget into your monthly expenses, does it go directly into savings, or do you treat yourself with it? 46 Responses to "Irregular Income: Gravy Edition"
Mr. PoP’s income bounces around a LOT, but luckily I get paid enough that we can live on my income and put his directly toward savings, debt paydown, investment, etc. Living on one salary – awesome! Do you keep the same allocation ratios for his salary or do you switch it up often? I think this is agreat idea, never count on ‘side money’ or ‘volunteer money’ or whatever, because you never know when it’ll disappaer; i think counting it as gravy money is a great idea. I think it depends on how dedicated you are to the side hustle and how able you are to live on your primary income. We are not dedicated and our primary income is certainly enough so no inflation for us! I guess my bonuses are sort of irregular income? Except they’re now somewhat large to the point that I can’t spend it all even if I wanted to! I save 100% of them and they’re great for knocking off savings goals quickly. I used it to build up my emergency fund a bit more (closer to 12 months now), contribute to my 2012 Roth IRA, and pay down the mortgage principal. My primary income is more than enough, so I don’t want to inflate my lifestyle with the bonuses because they could always be smaller the next year. Sounds like we’re on the same page even though it’s a much different scale! 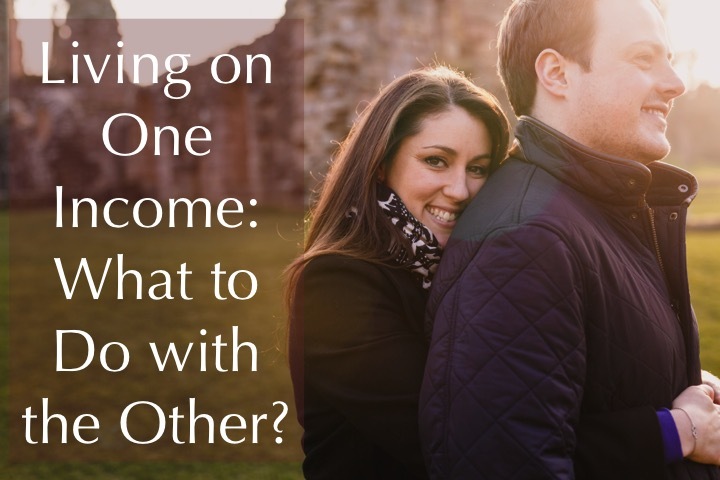 As long as you have those prioritized savings goals already you have a place to put the gravy income without even having to re-make a decision. We live in a seasonal tourist area, and we are both able to pick up small side jobs throughout the summer. Last year we saved everything we made because we had a good feeling that Liam’s job wasn’t going to be refunded and needed something to cover us while he looked for work. Right now we have a list of not-yet-needs that we are trying to put off until the extra money starts coming in- a new phone for Liam, our dog’s yearly appointments, new dress shoes for me, etc. That’s great that there is extra work available and that you were able to set your earnings aside untouched! I know what you mean about waiting on nearly-needs – we have to be patient until our targeted savings can pay for certain purchases. I get some extra income through my online businesses and I don’t mix it with my normal budget either to avoid lifestyle inflation as you put it so well. The only exception is if their is a huge emergency or to invest a few of those dollars back into my online businesses to earn more cash flow. So what do you do with the extra money under normal circumstances? You guys are smart to put it toward travel. I’m realizing the importance of vacations more and more with each year! 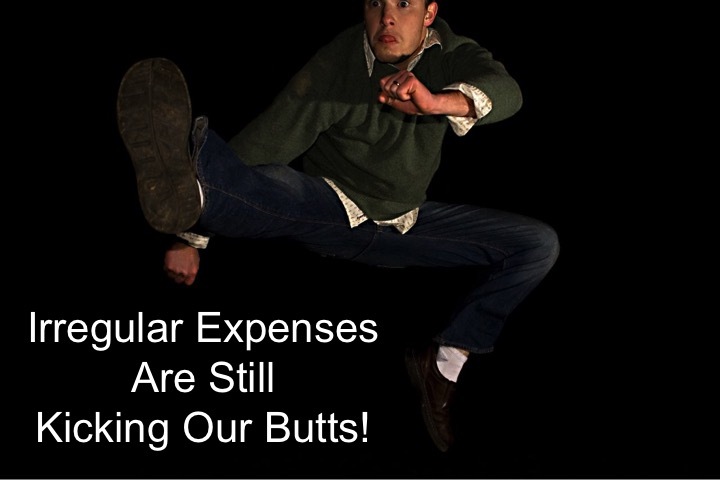 What would you do about big expenses if you didn’t have the side income – do you have a bulk of savings that you are refunding? The travel money is more likely going to be spend visiting one another while we are apart next year. :/ Or if we have much lower expenses than we expect maybe we’ll take a vacation. My blog income is both irregular and unbudgeted. I’m currently using it as savings for when the irregular income of my day job doesn’t meet my needs and then paying down debt. Once the debt is paid off, I haven’t really decided what I’ll do with the money. Max out my IRA, to be sure. Anything left over, I might use to afford going to the movies more (seriously, if I had the money, I’d probably see about 30 movies per year), and buy more premium ingredients for cooking. Sounds like you are being very prudent to save the money first for underemployment. I hope that you get the opportunity to save it for the long-term and use it for entertainment! After I quit, my income has been nothing but regular. It is extra challenging because we had a budget with two income and have to downsize into half, not including the irregular (very small so far) income. We have made it work using his income alone, we were saving mine mostly before so that helped. The thing is I wanted to save the same amount even with half the income. Unrealistic expectations. Anyway, now we have settled in a groove. We budget based on my husband’s income, anything that I made goes into accomplishing our goals faster. Good thing you were more or less living on one income, but yes those expectations were unrealistic! Sounds like you have a good set-up now with your gravy income going toward goals. 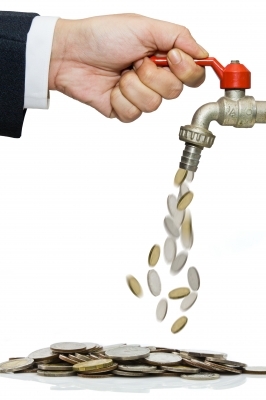 My income is front loaded, so it means that I’m front-loading my goals, too. I think I’ll be out of debt by next month, and then I’ll fully fund my 2013 IRA, and start saving in a general, non-targeted account. Kathleen, Frugal Portland recently posted..Should you Hire a Blog Coach? We just throw it in savings. Then once or twice a year (usually after taxes and after the long unpaid summer) we shuffle extra money into IRAs and the mortgage and the occasional big purchase. It’s great that you’ve settled into a seasonal pattern. Any irregular income that I receive just goes into my savings account or our house down payment account. Either one will get funded. Sometimes I will use it to treat myself, but rarely do I use the whole amount that I received. Does your savings account have a specific purpose? I’d love to start putting our gravy income toward a house downpayment like you! Applying for part-time jobs in the evenings or weekends, around full-time job schedule. If I get one, most of that money would go into savings which are lower than I like in order to max out Roth IRA. I would love to max out our Roths, too – good luck! I view my Roth IRAs as emergency emergency savings accounts since principal can be withdrawn without penalty. Knock on wood, that won’t happen! I’ve heard of some others using it that way, but we don’t. How is your Roth invested – cash, mostly stocks, a different allocation? Hm… I’m sure you know the arguments against that strategy so I won’t go into them! I hope you don’t have any emergencies, of course, but if you do I hope you’re able to ride them out okay and that you are seeing some returns that make this worth it (I’m sure you have over the last several years). I like your expression “All gravy”. Indeed it is! Too many people, myself included in the past, think of extra money as a bonus at first and then part of a standard lifestyle later. You’re definitely right to be cautious. Whenever we (wife & I) do overtime it’s not spent but saved up… just in case! What are you saving for? Are you more motivated to work overtime to pad your savings or give yourself a spending bonus – or is it the same? Fantastic!! I treat all of my blog advertising revenue as gravy as well. The Happy Homeowner recently posted..Saving Money While Shopping…And a $500 Giveaway! What do you do with the money? Are you investing some of it back into your blog? My wife does eBay, and while it doesnt change our income so much it did buy christmas and his winter clothes. What we have extra we put in a college fund for him. Im just picturing the cost in 18 years. That’s great that you offset some costs with the extra income and put the rest in savings! Woot woot! Extra income FTW. I generally put it all into savings. Right now all my extra income is going straight into our travel/honeymoon fund. I love this post. Other than my 9-5 I earn extra money per year from my side business and I consider that all to be gravy. If I don’t need it then I save it but if I want to go on vacation I spend it. Great post, I am going to share it on Dinks Finance next week. Thanks for the support! How long does it take you to save for a vacation with your side hustle money?